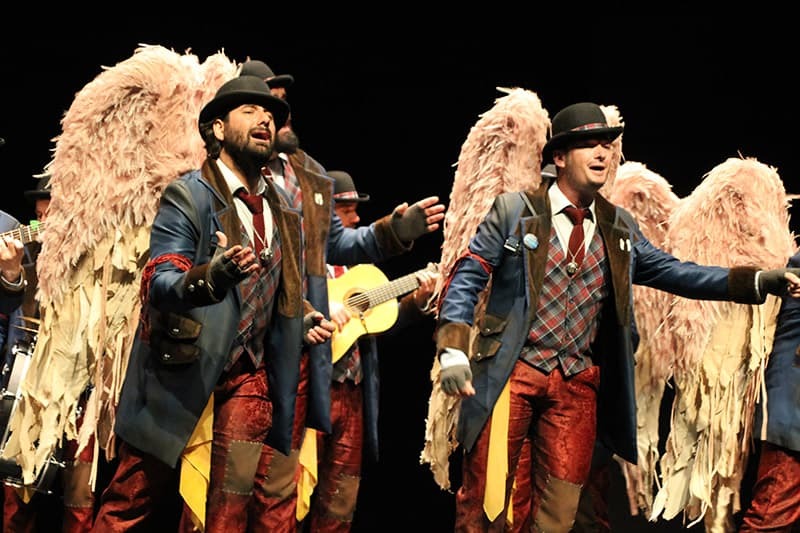 At 7:00 p.m. on Sunday, April 15 and at Teatro-Cine Paz de Miguelturra, the performance of the Comparsa “Los Ángeles de la Guarda” by the Carapapa brothers began, in an event organized by the Peña los Cansaliebres of the town. Practically filled the capacity of the theater to witness the performance of one of the semi-final comparsas in the COAC 2018. 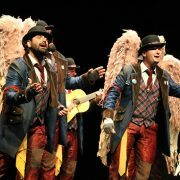 Throughout his performance, the troupe has managed to lift the audience from their seats, receiving the ovation of it on numerous occasions, but especially with the interpretation of the pasodoble dedicated to Xabi, the three-year-old boy who died a victim of the cruel attack jihadist on the Ramblas in Barcelona. At the end of the performance, the president of the Peña los Cansaliebres, Alberto Soria and the President of the Carnival Association of Miguelturra, Raúl Domínguez, gave the members of the comparsa a nice memory of the Miguelturra Carnival. Among those attending the event, was the King of Carnival, Serafin Delgado and the Councilman of Celebrations, Diego Rodríguez. https://carnavaldemiguelturra.es/wp-content/uploads/2018/04/carnaval-miguelturra-angeles-2018-008.jpg 533 800 berna https://carnavaldemiguelturra.es/wp-content/uploads/2017/02/logo.png berna2018-04-15 12:53:372019-01-01 19:37:00Performance of the Comparsa "The Angels of the Guard"